Updated edition! This helpful companion to the book, Growing Up with a Bucket Full of Happiness: Three Rules for a Happier Life, is a journal designed to put bucketfilling knowledge into action and create a happier life for its young reader. 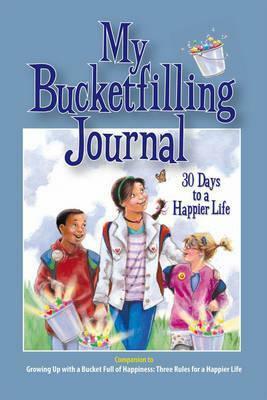 In addition to the Bucket Fillers Pledge and the three rules and three laws of bucket filling, the journal features a thirty-day plan for filling buckets for thirty days, which includes eight self-reflection questions and 30 pages on which to record daily thoughts and bucketfilling experiences. This journal is for everyone who is working to be a better bucket filler! -Have You Filled a Bucket Today? -Will You Fill My Bucket? Carol McCloud published her first book, Have You Filled a Bucket Today? A Guide to Daily Happiness for Kids, in 2006. Since then, she has authored or coauthored seven additional books on "bucket filling." Carol is a graduate of Oakland University School of Education, a certified Emotional Intelligence Trainer and a long-time member of the National Association for the Education of Young Children (NAEYC).